Who doesn’t want to change in his or her life? Everybody wants some change in his life. In fact, it is the law of our nature. Change is the natural order. But many of us want too many changes in life. Is it really possible? No! And those who want too many changes in their lives; they always face many hardships and hurdles, and always remain unhappy. Always remember that-one story may change your life. One idea may change your life. One thought may change your life. One incident may change your life. One event may change your life. In life anything can happen and possible that you wouldn’t expect. Life is full of surprises and uncertainties. So, it is always better for you to prepare for the future event or incident; because anything can happen in life. It is well said that a wise man always learns from the mistakes of others. We always learn from our experiences. But question arises, that how many times we try our experiment with life to learn something. It is never possible. We couldn’t sacrifice our life every time, because our life is not a screening movie or drama. We couldn’t experiment with our real life. So it is a smart act for us to learn from the mistakes of others and mend our life before anything happen. But, it is sorry to say, that there are many of us who enjoyed while experimenting with their lives. And the end result is their lamenting and regretful lives. 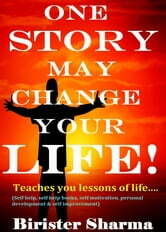 ‘ONE STORY MAY CHANGE YOUR LIFE,’ is a book of well collections of thirty short stories. In this book, you would learn about the morals, wisdoms and knowledge of life which helps you to motivate and encourage in your life and guides you to the path of righteousness. * This book helps you to know your life. * This book teaches you the real meaning of life. * This book teaches you to realize your strengths and weaknesses. * This book helps you to gear up your self-belief and confidence. * This book acts as your true guide of your life. * This book is a bundle of motivations and inspirations. * This book is well collections of moral stories, wisdom, ideas, and thoughts. 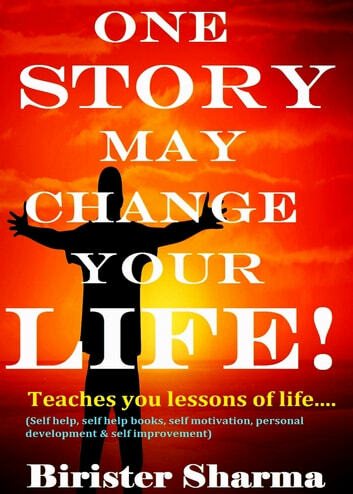 Books related to One Story May Change Your Life! (Teaches you lessons of life,morals,wisdom,motivations,inspirations, life's goals,aims and objectives,self-help,self-esteem,self-believe,self-control,happiness & success).